Our specialist treatment service can provide assessment, diagnosis and treatment programmes for children and young people with CFS/ME anywhere in the UK. The team comprises specialist consultant paediatricians, Psychologists, Physiotherapists and Occupational Therapists, and is led by Professor Esther Crawley, one of the few consultant paediatricians specialising in CFS/ME in the country. We accept referrals from across the UK, and currently offer the opportunity for CFS/ME treatment without the need for travel within the FITNET-NHS Trial (see below). Chronic fatigue syndrome or myalgic encephalomylopathy (CFS/ME) is relatively common in children, affecting at least 1% of teenagers. It is probably the largest cause of long-term absence from school. Despite this, there are very few teams in the UK who specialise in seeing children with CFS/ME, and even fewer who are able to see severely affected children in their home. who has CFS/ME and needs help. We have particular expertise in helping and supporting children who are severely affected, as well as children whose case may be complicated by more than one problem. The outlook for children with CFS/ME who access appropriate treatment is excellent, with most making a good or complete recovery. We therefore aim for recovery. We believe that all clinical care should have an evidence base. We therefore only offer treatment that has been recommended by NICE. 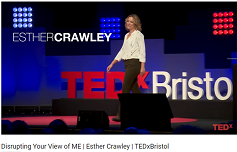 Professor Crawley leads a research team based at the University of Bristol which conducts research in to the causes and treatment of CFS/ME. This means that all the treatment offered by the clinical team is based on the most up-to-date research results. One of our excellent team providing care within the Paediatric CFS/ME Treatment Service was awarded the RUH Chief Executive's Customer Care award in December 2018. They were nominated by the parents of a young person they had worked with over a two-year period. The Staff Recognition Committee was impressed by their dedication and kindness, and noted that their support to the young person and family was obviously greatly appreciated. The family described our team member as providing support when they were low and the praise they all needed to help beat the illness. The FITNET-NHS Trial, a randomised controlled trial comparing two Internet-delivered treatments for children with (CFS/ME) who do not have access to a local specialist CFS/ME service. This trial brings CFS/ME treatment to UK families without needing to travel. This trial aims to find out how many teenagers with CFS/ME have depression and how best to identify them. The study recruits teenagers with CFS/ME after their first appointment with the team. Teenagers are assessed for depression and other mental health problems, and are asked to fill in two short questionnaires about symptoms of depression and anxiety. They can choose to be interviewed by Skype or face-to-face, at home or at the hospital. The study will help us to find out how good the questionnaires are at picking up depression and other mental health problems in teenagers with CFS/ME so that we know which questionnaire is best to use. This trial aims to improve treatments for younger children (5-11 years) with CFS/ME. We want to learn more about CFS/ME in this age group, and so we are inviting families to complete questionnaires when they first attend the service, at 6 months and at 12 months. We are also inviting families to have a discussion with a researcher so we can find out about the experiences and opinions of children and their families. The MAGENTA TRIAL closed to recruitment in March 2018 and is one of the largest clinical trials assessing treatment for Children & Young People with CFS/ME. MAGENTA is designed to test treatment by ‘Graded Exercise Therapy’ compared to ‘Activity Management’. As part of a series of programmes on BBC Radio 4 looking at this condition, Case Notes presenter Dr Mark Porter accompanied Professor Crawley in her clinic to find out more about CFS/ME and meet some of the children who have been affected by this condition. You can listen to the Case Notes programme on the Radio 4 website.